The good-running 1400cc 1995 Suzuki Intruder for sale has been a reliable, fun motorcycle to own and ride. The Suzuki Intruder 400 has just 24,000 miles and will come with a bike jack. I will accept the first REASONABLE offer as I am moving out of the state soon and would like to sell it before I leave. and then those of you who know something about this bike can use the comments form below this ad to write a review or voice any opinions that you may have on the Suzuki motorcycle for sale in this listing pointing out any problems with its performance, where to find used Suzuki motorcycle parts or anything else that you feel potential buyers trying to make a decision as to whether or not they want to buy should know. Thanks for visiting GoGoCycles Used Motorcycles for Sale and for your interest in the 1400cc 1995 Suzuki Intruder for Sale">1400cc 1995 Suzuki Intruder for Sale. 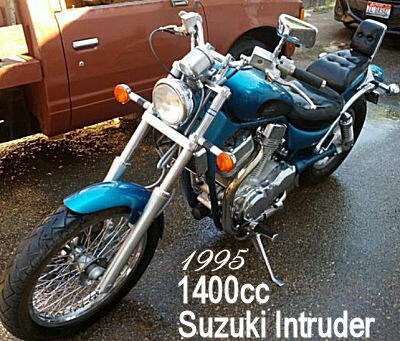 The location of the 95 Suzuki Intruder 1400 is Boise ID Idaho and in my opinion my asking price for this bike will be difficult to beat on Craigslist or on Ebay; just $1300 but you are welcome to call me with a REASONABLE offer for consideration! If you want to take a look or have questions, email for more details or to request picture and don't forget to mention that you found this ad on GoGoCycles Used Motorcycles and Parts for Sale www.gogocycles.com. Sad I missed this one. I've been looking for an Intruder to buy. Wish this one was mine! Join in and write your own page! It's easy to do. How? Simply click here to return to SUZUKI INTRUDER 1400.